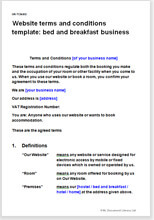 This terms and conditions template is suitable for any bed and breakfast business or boutique hotel. It follows industry standards, and can be customised easily to suit your business. These T&C should give your guests realistic expectations about the service you provide and give no case for argument that you haven't made them aware of the rules. While there are always going to be difficult guests, having well written terms and conditions should make it easier and less costly to resolve problems and disagreements. In the hotel and leisure industry, many contractual terms are also part of the explanation of what is provided (for example, what is included in the price of a room, or how a customer can cancel a reservation). We have followed the industry practice of presenting the terms in a style that does to look like a legal document and that does not use legal jargon. The terms themselves have been written for placement on your website. We assume that your guests will read and accept them just before confirming a booking (or giving their card details, if you take this information online). They could be adapted for print and used when guests walk in "off the street". We offer another set of terms and conditions for larger hotel businesses that provide a greater range of services in addition to accommodation, such as function room hire, function catering, and business meeting rooms. You may be interested to look at: Website terms and conditions template: hotel. The law in these T&C is largely common law that deals with the basics of contracts: offer, acceptance, price and payment, provision of service, liabilities and risk. That means that, by and large, you can set the terms you want. Our guidance notes will tell you what you can change safely, and what we don't advise changing.